IT might not be peak sunshine season but in the seaside town of Blackpool it has been harder than normal to get a parking space on the promenade in recent weeks. Most of the bays have been taken up by disabled drivers. When investigators looked a little closer at the disabled blue badges left in the windscreens, apparently entitling the drivers to free parking breaks, they found many of the cars had something strange in common: their permits had all been issued in Camden. The New Journal has learned that an unusual link between north London and the north west is currently under investigation but one of the main theories is that swindlers are ferrying stolen or cloned parking dispensations out of Camden to areas where they think they won’t be spotted. A similar trend has apparently also developed in South Tyneside. 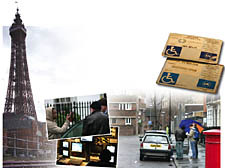 If they are being used fraudulently, the proper owners may not even be aware that the permit meant for them is part of the scam, especially if their badge has been reproduced using “sophisticated” computer equipment and scanners used by underground counterfeits. Blue badges, stolen, lost, faked or borrowed, are gold dust to a driver searching for cheap or free parking in congested areas like Camden. Hot-spots for blue badge fraud are in Hampstead, Belsize Park, Somers Town and Euston. The permits are meant to make life easier for some of the borough’s most vulnerable residents, helping them to avoid long walks from their cars, but investigators are increasingly concerned that fit and able drivers are either borrowing them from friends and relatives or using black market badges. A special New Journal investigation three years ago revealed how the permits could be transferred in dodgy pub deals for hundreds, if not thousands, of pounds. At the time, the permits were being stolen by smash and grab thieves powering their way through car windows. There is a suggestion that the value of black market badges is falling, possibly because they are becoming easier to steal or fake. One cheat said in court recently that he had bought his for just a £1 on the street after being approached near a ticket machine by a racketeer. The New Journal was invited to an operation in North Gower Street, near Euston station, where plain clothes investigators – helped by spotters in a CCTV surveillance van – stopped every driver displaying a blue badge fraud. The random checks immediately threw up contraventions. There was a man in his late teens, well built and in a hoodie, whose blue badge turned out to have a picture of an elderly man with white hair – his father. Without a valid excuse, the badge was confiscated on the spot. Minutes later, the same fate was suffered by a driver who claimed he thought he could use his friend’s badge because they shared a house in Hampstead. It was a baffling excuse but investigators have heard it all: including one tall tale about a disabled pole dancer who illegally loaned her dispensation to a builder for his daily calls. It might seem like a minor offence but officers are determined that those who need the parking charge exemptions most should get them and that parking spaces in places like North Gower Street, so close to the University College London Hospital, should be available for the needy. Other checks on Thursday morning were made on builders’ vans equipped with ladders and heavy duty tools – not the kind of gear that you would expect from drivers suffering from disabilities. Even just a single morning on patrol reveals how prevalent the problem has become and how determined Camden’s investigators are to stop the blatant misuse. Some roads around Euston have 25 disabled badges in the windscreens. When it comes to potential criminal gangs spreading cloned badges, investigations naturally have to be passed over to detectives, but the council has stepped up its bid to stop the everyday offenders, the casual misuse and unfair borrowing. In the past, offenders who were taken to court ended up with a fine that they might have thought was worth all the money saved on cheating the system but some drivers are getting the nasty shock of a full disqualification from the roads when hauled before the courts. Camden will announce later today (Thursday) how it has stepped up enforcement action which does not end with a tap on the shoulder on the kerbside from the plain clothes team and a quick confiscation. In the first four weeks of the year, 20 prosecutions were brought before Highbury Corner Magistrates’ Court. The biggest hit was on January 18 when six people pleaded guilty to a range of offences, including forgery and misuse of disabled parking badges. Roy Norris, from Kingston, was fined £400 and banned from driving for a month after admitting using a forged disabled parking permit. Abdul Malik, who lives in Camden Town, was banned for two weeks and fined £100 after confessing to handling stolen goods. More cases have been booked for later this month.